Toronto Film Society presented Nob Hill (1945) on Sunday, November 25, 2018 in a double bill with Confession as part of the Season 71 Sunday Afternoon Film Buffs Series, Programme 3. Production Company: Twentieth Century Fox. Producer: André Daven. Director: Henry Hathaway. Script: Norman Reilly Raine, Wanda Tuchock, based on a story by Eleanore Griffin. Cinematography: Edward Cronjager. Editor: Harmon Jones. Music: David Buttolph. Release Date: June 13, 1945. 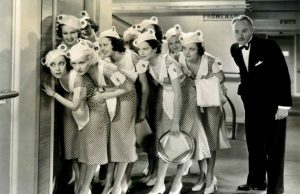 Cast: George Raft (Tony Angelo), Joan Bennett (Harriet Carruthers), Vivian Blaine (Sally Templeton), Peggy Ann Garner (Katie Flanagan), Alan Reed (Dapper Jack Harrigan), B.S. Pully (Joe the Bartender), Edgar Barrier (Lash Carruthers). 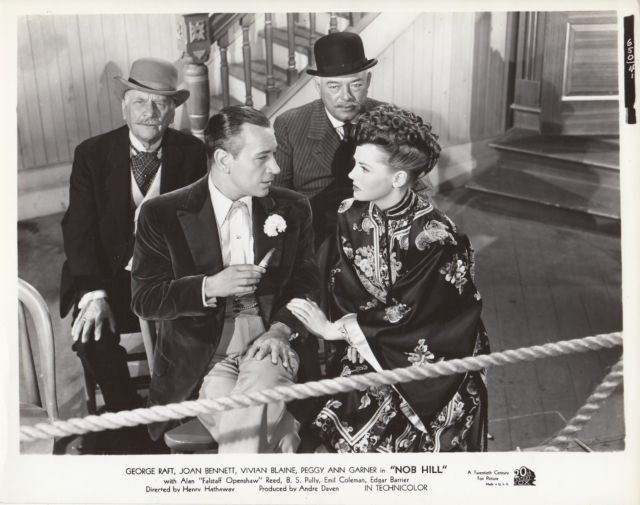 Nob Hill was the third and final film in which George Raft was directed by Henry Hathaway. Aside from a couple of times when Raft walked off the set after arguments with the director about the development of his character, it was an easy shoot. The opening montage of San Francisco streets was footage lifted directly from the 1943 film Hello, Frisco, Hello. The story had a good mixture of sentiment, music, romance, comedy and drama done in a tried-and-true formula. Hathaway was one of the few directors who understood how effective a demoralized Raft could be and when it occurred in this film it was his most convincing emoting. Although George never seemed to have a problem attracting women, he was always afraid of rejection. He would never make the first advance. He either went out with call girls or women he rated as high class and whom he felt were “above” him. Nob Hill reflects a characteristic of Raft’s relationship with women. Joan Bennett and Vivian Blaine, who vie for Raft’s affection in the film, were both fond of Raft in real life. Nob Hill was Peggy Ann Garner’s follow up film after making A Tree Grows in Brooklyn. Nob Hill was one of several similar films that 20th Century-Fox made up to the mid-fifties which combined music and nostalgia in a money-spinning formula. While it was not necessarily the best of its genre, Nob Hill proved to be one of the top-grossing films of the year with domestic rentals of $3,104,000. The most disappointing aspect of this film was that, considering the musical content, Raft did not do any dancing in it. It may be that a dance scene involving him was shot, but ended up on the cutting room floor. The film was notable as being one of the only two colour films Raft made during his starring days. It was also his most opulent and the photography was beautiful. Plot: The owner of a San Francisco saloon yearns to rank among the upper crust of Nob Hill society. When he begins romancing a wealthy socialite, it looks like he may have his entry into this. The pretty star of his saloon’s show, however, wants to make sure he stays on the Barbary Coast. The film is based on an original screen story about a ten-year-old Irish girl in 1860s San Francisco who arrives there intending to join her uncle but discovers that he is dead. She gets adopted by a gambler because she is good luck. Like several other 20th Century Fox Technicolor musicals set in the recent past, it takes place in a saloon, revolves around a love triangle, and was intended as a vehicle for Peggy Ann Garner, who had just impressed in Jane Eyre. Various changes in the original cast and direction resulted in Henry Hathaway being offered the direction, but he refused because he was uncomfortable with filming a musical. Threatened with suspension by studio head Darryl F. Zanuck, he reluctantly agreed on condition that he could reduce the amount of musical interludes and eliminate a racist sequence making fun of a Chinese servant. 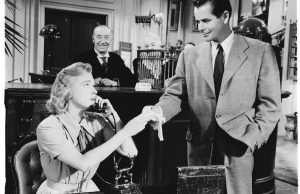 Fred MacMurray was originally cast as Tony Angelo, but had to drop out because of other commitments. Henry Hathaway (1898-1985): Of mixed American and Hungarian ancestry, he began working in silent films in 1925 as assistant to such directors as Victor Fleming, Josef von Sternberg, and Fred Niblo (on the 1925 Ben-Hur). He began his directorial career in 1932, with westerns based on the novels of Zane Grey, including Heritage of the Desert, which gave Randolph Scott his first starring role. He soon became established as one of the main directors for Paramount, and later films for the studio included the hugely successful Lives of a Bengal Lancer (1935), with Gary Cooper, Peter Ibbetson (1935), also with Cooper, and The Trail of the Lonesome Pine (1936), his first movie in colour. 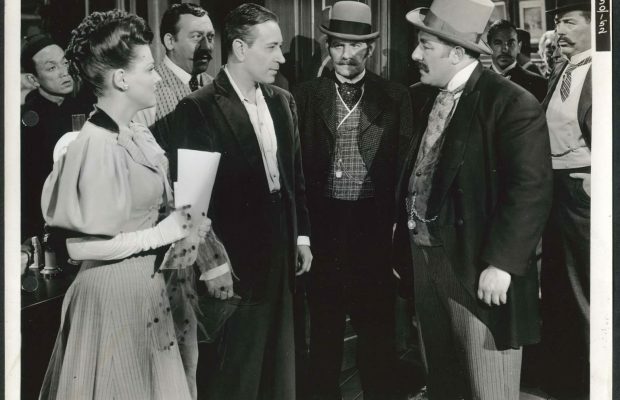 He moved in 1940 to 20th Century Fox, where he directed Tyrone Power in Johnny Apollo and Brigham Young, before returning to Paramount to direct John Wayne in The Shepherd of the Hills in 1941, and then going back to Paramount for Nob Hill and other films. During the 1940s, he made an important series of semi-documentaries with a film-noir flavour, such as The House on 92nd Street, 13 Rue Madeleine, Call Northside 777, and Kiss of Death (1947), with Richard Widmark as a psychopathic, giggling killer. Then came The Desert Fox, a biopic of German General Rommel, and Niagara (1953), the breakthrough role for a young Marilyn Monroe, as well as Fourteen Hours (1951); Seven Thieves (1960); and Westerns such as The Sons of Katie Elder, Nevada Smith, and True Grit in the 1960s as well as a segment of the Cinerama Western How the West Was Won, in 1962. He died of a heart attack in Hollywood in 1985. George Raft (1901-1980): Born of German-Jewish parents as George Ranft in New York City, he started his stage and nightclub career as a dancer before moving to Hollywood in 1929. He had a small role in Taxi! in 1932, followed in the same year by success in Scarface, as a nickel-flipping gangster (comically reprised in 1959 in Some Like it Hot). He followed this with extremely popular gangster and tough guy roles in the 1930s, and was constantly suspected of close involvement and association with real-life gangsters that allowed him to protect fellow actors such as James Cagney and Gary Cooper, who had somehow offended underworld figures. His career sharply declined after hitting its peak in They Drive by Night, and ended in work in television and supporting roles in movies. Though his marriage in 1923 lasted until his wife’s death in 1970, they had separated for many years (because, as a Catholic, she had refused to divorce him), and he’d reputedly had affairs with Mae West, Betty Grable, Marlene Dietrich, Norma Shearer, and others. Joan Bennett (1910-1990): Born into a theatrical family, and younger sister of the actress Constance Bennett, she appeared as a child in her father’s film The Valley of Decision; married and quickly divorced at the age of 16; and made her stage début at the age of 18, acting on Broadway with her father in the popular success Jarnegan. By the time she was 19, she had become a movie star in such films as Bulldog Drummond, in 1929, sharing top billing with Ronald Colman. This was followed by several films for Fox in the 1930s, also receiving top billing. 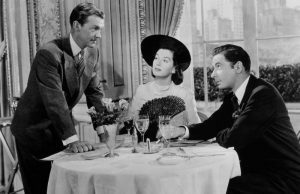 She then left for RKO and a role in the 1933 Little Women, directed by George Cukor, after which she developed a new screen persona as a glamorous and seductive femme fatale; in particular for four films directed by Fritz Lang—Man Hunt (1941), The Woman in the Window (1944), Scarlet Street (1945), and Secret Beyond the Door (1947). She continued in similar roles for Zoltan Korda’s The Macomber Affair (1947), Jean Renoir’s The Woman on the Beach (1947), and Max Ophuls’ The Reckless Moment (1949), while maintaining for Vincente Minnelli, in Father of the Bride (1950) and similar films, the role of an elegant, witty, and nurturing wife and mother. 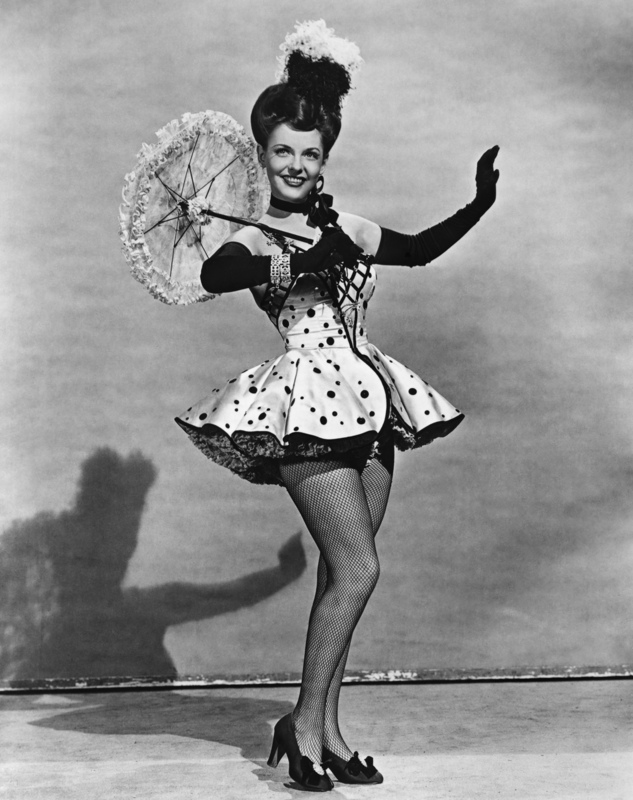 But her career was disrupted by a sexual scandal involving Bennett, her husband Walter Wanger, and her agent Jennings Lang, after which she made only five films in the following decade, resorting more to the stage and television. She died in 1990 at the age of 80.